Its been a while since we have updated, and mostly because its been a lot going on and we have been busy. Last Thursday Emily had clinic and it was a pretty long day. That morning Emily complained that her legs were hurting and she wouldn't walk from neuropathy, so she had to be carried out to the car. She lost about a pound and Daddy and I decided we would stop the Nifurtimox knowing that if we didn't she would continue to lose weight and they would win the battle this time and admit her. 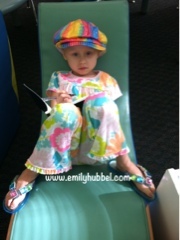 Emily had been doing a lot of sleeping since her last time at the clinic, which we let them know, and when counts came back Emily needed both platelets (at 5) and blood (at 7.4). She was given benadryl because of her allergic reaction to the platelets, well an hour after giving her platelets she had another allergic reaction, but it seem to go away quickly and they were able to start the blood back up. Most of the weekend was watching Emily lay on the couch, she didn't want to be messed with and she didn't eat much either. She slept a lot and complained of pain. Of course this brought Doug and I's mind to what in the world is going on? Progression? What could it be? Monday morning she had clinic again, and we were going to let them know about our weekend. Emily was still complaining her leg was hurting and Daddy thought maybe it is from the Zometa. The problem with the Zometa, we knew we couldn't ask them, since they didnt' have any experience on giving it, so we would talk with Dr. Sholler about it. As I walked in with Emily, Elaine, our nurse, asked how the weekend was and said she heard about the calls that were made. So, she also had some concern about what was going on. Counts were checked, and because of the concern of the leg, Dr. Gowda ordered a xray just to have it checked.Platelets low again (at 8) so she would need them when we got back. Xray was done and reviewed and we were advised that she doesn't have a fracture, and that there is only abnormality of the bone, but they don't know what the abnormality is from. Whether it be from radiation, from the spot or from the disease doing whatever. So, while the Xray only gave us good news in that there isn't a fracture, it didn't really let us know anything else, and they can't really compare anything because VCU doesn't do scans. It was said send her home after platelets on Tylenol w/Codene and we will revisit this on Thursdays visit and see how she is feeling. Emily is finally starting to come around again, coming off the couch just a bit more and actually trying to eat a bit more. She isn't complaining as much about the pain in her right leg, however it still hurts to touch and she isn't limping much, but you can tell. She freaks out when you try to touch it, but isn't complaining about it much. As of Monday she was still neutrapenic, so we have been hanging low at home, together as a family. This cancer journey is a journey that is hard, hard on everyone in the family! Not only do we hate cancer, we hate everything that comes a long with it.... When little things like this happen to Emily, our minds immediately run to the worse and we hate that, but it is what happens. While we are not sure what is causing the pain, and why it still hurts to touch, we are hoping that as her counts go up, that she will feel better and the pain will also go away. Right now only time will tell and we will see how things go. We will see how she is doing when we go back for counts on Thursday to check things out for her. Dad and I try to remain as positive as we can, but sometimes it is hard, but we are trying really hard to be positive about this. Your generosity and love means so much to us, and we just want to say Thank you!. I don't feel that we can say Thank you enough to all of the wonderful things that so many of you do for us. We will update you all to let you know how Emily's appointment goes on Thursday and how she is doing. Her spirits are starting to pick up some and she is starting to smile and laugh here and there. She has grown very attached to mommy lately and hasn't wanted mommy to go to work in the morning, which makes it really hard to leave. We are so proud of her and all that she does. She is really ready for treatment to be over though, and she has made that very clear to daddy and I, she just wants this to be over. We are right there with her, and hope that we will have an end in sight, but at this time, we just don't know. Her saying she was done with treatment, and didn't want to come to clinic anymore, brought tears to Daddy's eyes, because we wish we could be done with this too. Sorry for the long update and if this update seemed all over the place, but thank you for hanging in. Remember to hug and kiss your kids and tell them how much you love them, you never know when one day those things can change. Emily today on the couch watching a video on her ipad, tired. The past two days, Emily has been in her lows. She doesn't have a lot of energy at all and really hasn't done a lot of moving from the couch except for going to the bathroom. Tonight I did get her off the couch and into the tub, hoping that it would make her feel a little bit better. She doesn't really want to be messed with by her sisters and just wants to be left alone, except to rub my arm or daddy. Her eating has definitely decreased, enough to which has really concerned us. We are continuing to try and work with her and using the megace in hopes that we can just get her to eat. She is eating a few things, but not a lot. We obviously know the culprit and what is causing her not eat, however we are just continuing to hope that we can work around that. We are on the last 2 rounds of this trial, and like Dr Sholler said it would be beneficial if she can handle the dosage that she needs. So we are trying. What we don't want to happen is Emily has to go inpatient and be placed on TPN and lipids and we know she doesn't want to either. Plus the TPN will only set us back, so baby girl we really need you to eat. I know she is trying really hard for us, and to us that means the world. Tomorrow she has clinic, to have her counts checked and see where things are. I am sure she will need platelets, not sure about blood, but it is a possibility that she may need that as well. Its probably going to be a long day in the clinic. We are going to imagine that she is probably at zero for WBC, which means can't calculate ANC. So we continue to hope for no fevers. This is going to be short tonight, I am tired and ready for bed, but really just wanted to update and let you know where things were for Emily. Send your love and thoughts.. Here we are already a few days past the last day of chemo, which was Friday. Friday went well though, Emily did great with the chemo transfusions and because it was Friday, they wanted to have her counts checked to make sure she would be alright for the weekend. Emily was so happy to have her pictures taken with Stewie from the "Dogs on Call" Therapy Dogs and she will be in the 2013 Dogs on Call Calendar. Counts came back and we had noted earlier with Emily's nurse that we were seeing an increase of tiredness. After chemo, we were going to volunteer our afternoon and help with the Anthem Lemonade Stand, however Emily's counts stated otherwise. Emily would need a blood transfusion. So another long day in the clinic, overall was a pretty good day. WBC and ANC was still looking good. The weekend was absolutely great. We enjoyed spending time with our bestest friends and just enjoying company and having a relaxing time. Saturday was such a gloomy day outside, so much so it appeared to look as it was evening most of the day, that we stayed in the house all day and watched a few movies and enjoyed have our friends be at our sides. We enjoyed pizza, laughing, talking and just being together. 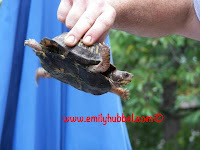 And for the first time, we saw a turtle in our yard. How neat is that. We learned about the turtle we found and the girls and I even fed the turtle some lettuce.Thank you so much for coming and visiting. Monday came all too quick, which meant another morning of time at the clinic. Counts scheduled for this morning and the neulasta shot. Emily has really become well aware of scheduling and when she needs to get that pesky shot that she despises. Just like it used to when she would need to get her port accessed, the fear of the shot to come, overcomes her. The tears start and then the crying takes over. She tries so hard to be strong, but sometimes she just can't hold the fear in. As you try to console her, all her mind allows her to think about is the shot to come and she can't let the shot out of her mind until it is over. For some reason today as I was sitting with her trying to console her, my mind ran back to the time when she was first diagnosed and they were trying to get an IV and was just having a hard time and her screams were all that I could hear. No today wasn't like that, but I sat thinking about all that this 5 year old little girl had gone through and wished she could be doing anything else but this. If none of this had ever happened she would still be in daycare, but today we continue to fight the fight with lots of hope along with many other families, old and new. She did get the shot, and did ok with it. She did scream as it the needle went in, but once it was done, she was ok and ready to get the port out so if she felt up to it later in the week, she could get into the pool. Today she didn't need any blood products however, platelets were pretty low (just not low enough to require a transfusion but low enough to cause a bruise where she received her shot on her leg. Daddy also had to get a shot today, so telling Emily about daddy getting a shot also seemed to help calm her down a little bit. Todays counts also revealed she is neutropenic, the joys of neutropenic. Back into the world of masks, not around people, no leaving the house, except for the clinic only and the fears of fevers and worse yet inpatient stays. We are noticing the increase of crankiness, fussiness from the nifurtimox, but she is handling it well, and again we are proud of everything that she does. The amount of food that Emily is eating is already starting to decrease. Weight has already started to decrease as well, not much, but 26.6 lbs down from 27.5, but still for her every little bit is noticeable and very well taken note of at VCU. Tonight we had dinner, and Emily took one bite and it was all she wanted. She fell asleep about 730PM and just recently woke up, she said she is hungry, so the hope is she will eat a little bit. Daddy and I will continue to keep up with her and make sure she eats as much as she can so we don't face having to stay inpatient and receive TPN or anything else. 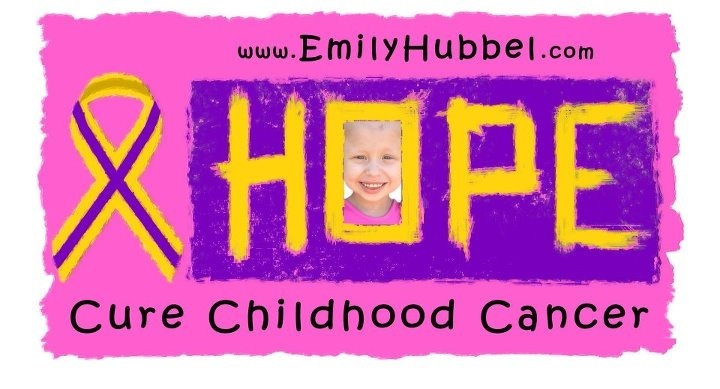 Emily will have clinic again on Thursday for count checks, but I have a feeling we will be watching her closely in what may mean that she will need to have to go and get platelets. We ask that you send out lots of love and thoughts for Emily as the next few days, we will be watching for fevers and/or bleeding and we hope for no problems. Brianna, Emily and Sue before they were heading. Thank you guys for visiting, we miss you guys so much! Emily has one day left of this round (round 5), that being tomorrow. 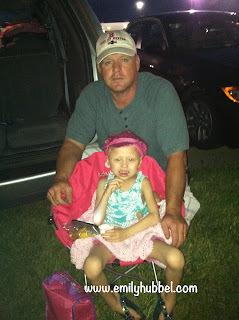 We will head to the clinic in the morning, have counts checked to see how her numbers are looking and then have chemo. Hopefully she won't need any blood or platelets because after clinic, we are volunteering our time at the Lemonade Stand. Emily will also get to take a picture tomorrow with the Therapy Dogs Group, "Dogs on Call" that comes in, with her favorite dog Stewie. 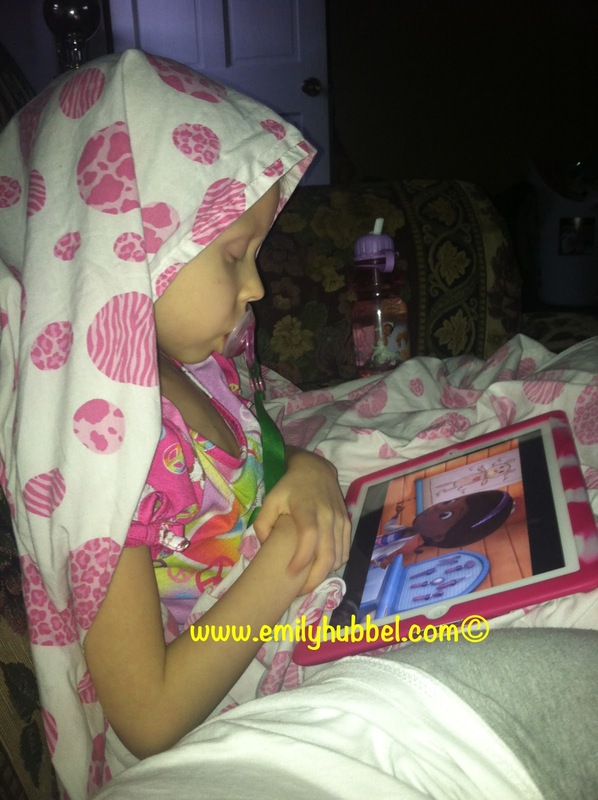 Emily has been doing ok this week, she has been falling asleep about 7-730PM this week and then getting up in the morning to go to clinic for chemo. During the day she seems to be doing fine, but during the evening she is a bit more tired. A couple of times this week she has complained of tummy pain, the first time we gave her zofran, but tonight we gave her some peppermint oil that we rubbed on her belly and that seemed to help a bit. As the week has gone on, she isn't eating as much, so we are giving her megace in the morning and evening with hopes that this will help with her eating. Thankfully she didn't have any side effects to the Zometa and overall seems to have done fine with that. 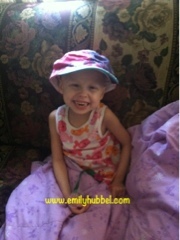 Emily will have her fluids tomorrow evening and then Saturday morning, I will be able to deaccess her. Sue and Jojo will be coming into town tomorrow afternoon to visit for the weekend and we are looking forward to relaxing with them. This round is already proving to be a bit harder on Emily than the last one. We would suspect that the increasing of the Nifurtimox the day before chemo up to 3 and keeping on probably has a lot do with that. We are hoping for no fevers, continued eating habits and no weight loss, so please hope and think about her during this time. Have you guys heard of Dr. Sholler? She is one amazing pediatric oncology doctor that specializes in neuroblastoma and medulloblastoma at Van Andel Institute and Helen DeVos. When we last saw her last week, she said to us, " Please tell anyone that has been trying to contact me, I am getting back to everyone, it has just been taking some time and I am not ignoring them!" Dr. Sholler has really picked up a lot of patients and we are happy to see her taking these patients in and having "HOPE" and taking care of them. Dr. Sholler not only researches many drugs that can help these children, she also does a lot of research on the natural/homeopathic field of things, and honestly that is just amazing and she shares what she researches. 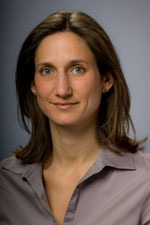 Dr Sholler has a great way with interacting with these kids and most of these kids who don't normally react with other doctors interact with her. 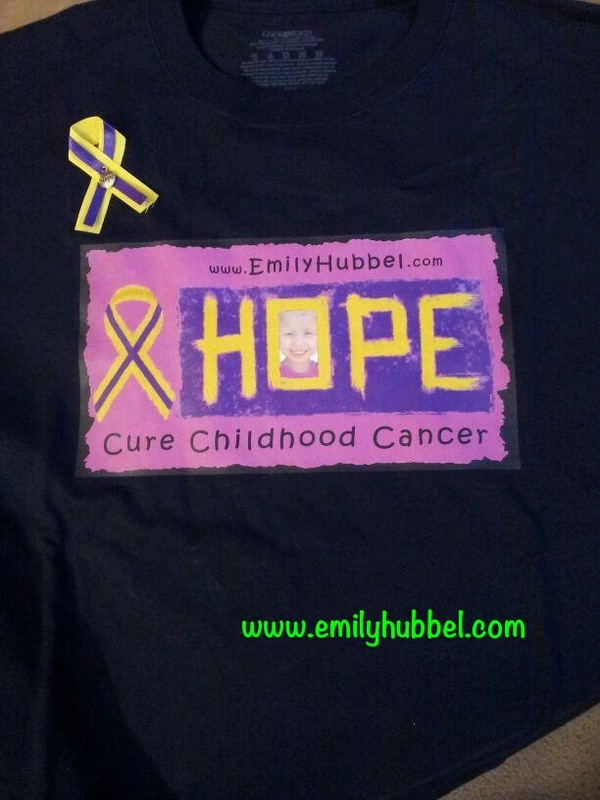 About a week ago, Emily's bestest friend Sue and Jojo, made t-shirts with Emily's Hope Cure Childhood Cancer. They were making them and sending them to us and Sue asked for Dr. Sholler's address because she wanted to send her the Neuroblastoma pin and a t-shirt and a thank you note. Sue and Jojo, you guys rock and we love all that you do for us and other families. Today we received a text message from Sue with the thank you note handwritten directly from Dr. Sholler. That is right, Sue got a "thank you" note from Dr. Sholler and my favorite part out of this note is "I do hope and believe that together we will make a difference". She said hope, what a woman to take a minute out to say "thank you" to someone who believes in her and what she is doing for our children. Dr. Sholler, we love you and thank you for all that you do for all of our families. 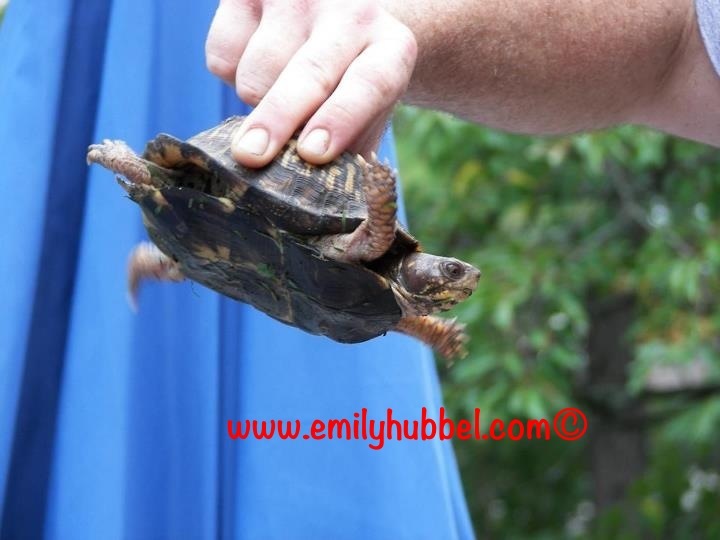 Just a quick update to tell you about how Emily is doing and Dr. Sholler. Please send out your love and thoughts for Emily for an easy Friday with no transfusions and no extreme drops of counts and a great weekend. Round 5 has started... Yesterday was a very long day in clinic and one that I know we are all glad that is over! 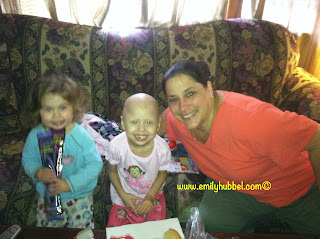 We had a couple of issues yesterday one of which was getting Emily the Zometa that Dr Sholler recommended! VCUs pharmacy has never given Zometa to children and we didn't have it written in a protocol! Zometa is actual in a few clinical trials for neuroblastoma (Bisphosphonates) that is to help with metastasis in the bones like Emily has! They were doing research trying to locate where Dr Sholler got the amount that she asked Emily get! Finally the pharmacy approved her getting the Zometa but they were going to give her less than the amount than Sholler recommended, and we wanted her to get what was required! Then Dr Gowda was able to pull up some references for the 4mg/m^2 dose and they approved the 2.4mg! 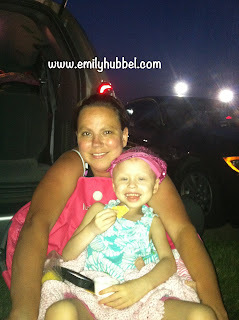 However prior to getting that she also had to have antacids to help the stomach since Zometa can upset the stomach, the other issue was Emily's specific gravity on the first day has to be =1.010 to start the chemo since she is getting cyclophosphamide (one of the chemo she is getting). It took her giving her urine 3 times to meet the amount and she finally met the specific gravity about 1pm so then she had to wait for the zofran! The pharmacy was one of our biggests issues yesterday! Yesterday was also a bit of a hard day seeing one of Emily's friends completing treatment for neuroblastoma and having the broviac Hickman line removed! We are so proud of her and their family for being done and getting through such a hard journey, but they made it! But Emily should be done with treatment also now and just knowing she is not there and how much longer she may have makes it really hard! Emily fights this journey with all of her might and we too fight with her! She too asked often lately when will I be done with treatment? A question dad and I have a hard time knowing what the answer is...we just continue to have hope that what we are doing is the right thing! Emily daddy and I will continue to hold your hand and walk along with you during your fight of this journey! Emily will be starting kindergarten in september and she is so excited about going and being with other kids and just having a somewhat of a normalcy to her! 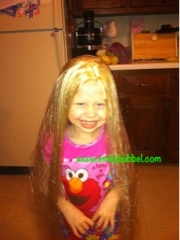 Daddy talked with her about school and her having hair and gave her a choice about hair and if she wanted to have hair! She told daddy she wanted to have hair so we told her we would figure out what we needed to do to get her hair for school! I was reading Emily griffins update and her mom was talking about getting a wig through VCU which I had no idea, so I inquired! The child life specialist Katie brought a form that needed to be filled out, "Application for Hair Replacement". Claire brought a box over yesterday that had a wig that they make and show the real hair that you can brush and color samples for hair, we were able to pick out a color that was the closest to her normal hair color and it is being ordered! The hair is real hair that can be washed, cut and styled so it will be nice for Emily to have and feel comfortable about going to school with! Thank you so much to this amazing organization "children with hairloss" a non profit organization. Day 2 of round 5 went off with no problems today! Thankfully it was a short visit!! 3 days left of this round and we continue to hope she has no issues! Counts were checked Monday and they will be checked again on Friday to make sure she is good for the weekend! We are looking forward to the weekend, Emily's bestest friends Sue and Jojo will be coming in Friday and staying at Hotel Hubbel to visit! We can't wait to see you guys! 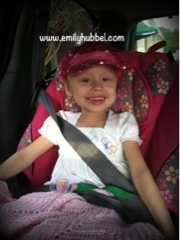 We will continue to keep you updated on how Emily is doing! Emily has been asleep tonight since about 730pm tonight, not sure if she is having side effects from the chemo or the Zometa, but hopefully tomorrow she won't be as tired! Tomorrow starts Day 1 of Round 5 of the nifurtimox trial for Emily! Today we started 3 tabs of nifurtimox along with the melatonin tonight! Tomorrow she will get accessed and stayed accessed until saturday when I take it out for her and get the zometa along with her regular chemo! Tomorrow will probably be the longest day all week since her specific gravity has to be at a certain amount on the first day and the rest of the week she will do fluids at night! Send your love and thoughts for an easy week and no problems! The to Michigan was short yet seemed so long! We are in the plane now flying home and they are aware of some weather in our home area so we may have to detour! (sorry im updating via ipad so if there is spelling issues, I'm sorry) Hopefully no problems but we are still so thankful for Wings of Mercy and what they do for us and other families! You guys are amazing!! Thursday turned out to be a pretty long day waking the girls up early, letting daddy sleep in since he had a hard time sleeping Wednesday night! Breakfast and playing and getting ready for clinic! The difficult part about Brianna ("Anna" is what she calls herself) coming along is she is not able to go into the HemOnc clinic because of their rules, but at least we are all together! 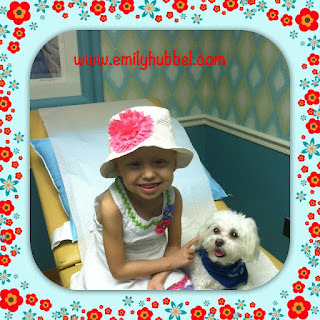 Emily had her blood drawn and a complete physical done by Dr Sholler! 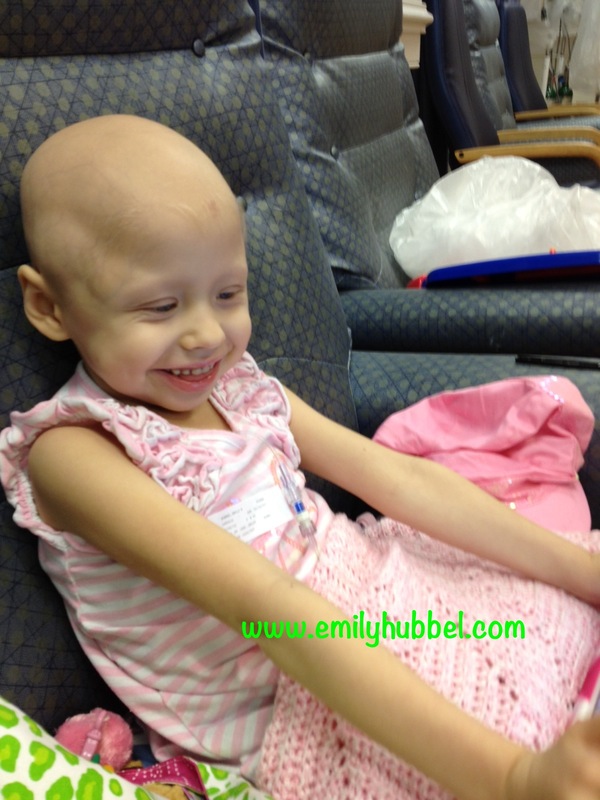 Emily's weight is 28.2 so thankfully she is continuing to gain weight! 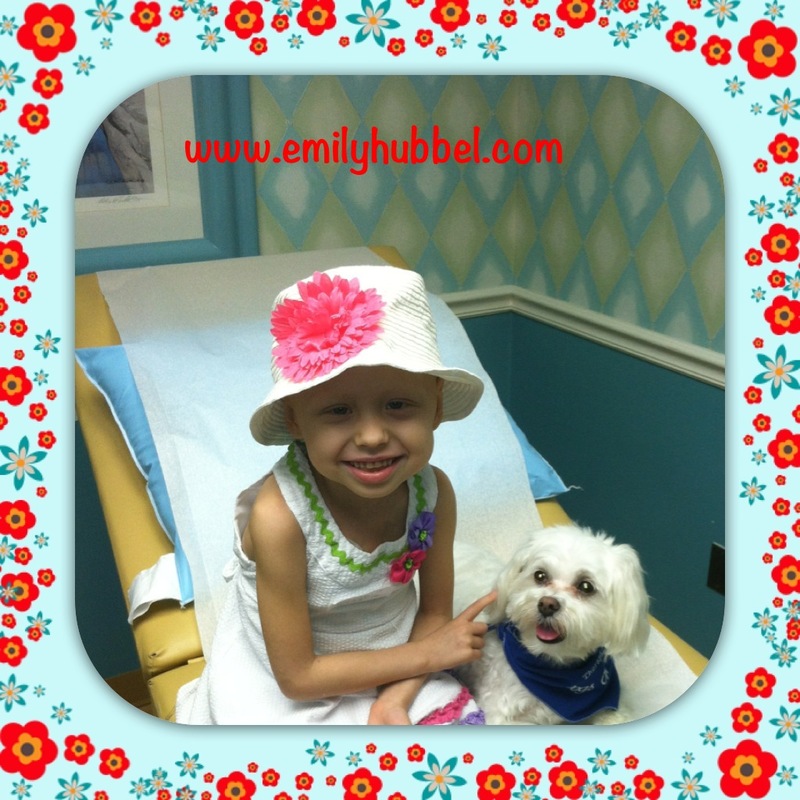 Dr Sholler is very happy with how Emily is looking and no major side effects! We went and had lunch and got a call from adult radiology that they were running pretty behind should have had scan at 1 pm but sedation was so far behind that they would hope to be ready by 2-230 pm! Brianna was exhausted as was Emily and then we got a call from clinic that Emily's platelets were low and she would need a transfusion! We thought they were coming up since Monday she was not needing anything but that didn't happen! Emily passed out during transfusion since she has to have Tylenol and Benadryl now because of the breaking out she had last week! We were late to scans but they were waiting for us! Emily is so amazing to lay completely still through about an hour and 10 minute scan and for the first hour she cannot move at all because of the CT needing to be fused to the MIBG! Daddy and I are very proud of her for being so strong and doing what she needs to do! Scans are currently showing STABLE, absolutely no change from the last scans! We are upset to know there has been no change but happy to know she is not progressing! Dr Sholler would like for us to move forward and do the last 2 rounds of this trial and then see where we should go then! The thought is antibodies (which she is going to research in the next month which one would be the best for Emily) and possibly maybe doing a biopsy of the spots and seeing what we are messing with! Dad also talked to Sholler about melatonin and what he read about it! Melatonin is a natural medicine and most commonly used for people who have troubles calming themselves enough to fall asleep! However some research has been done on it that taking it shows it works with cancer and one of those cancers specifically being neuroblastoma! Guess what dr Sholler knows all about this and even said she knows many NB patients that use curcumin which also has some great research for neuroblastoma! Dr Sholler is amazing and does a lot of research and not only about medicines but also about natural/homeopathic products! She recommended if we wanted to try it to move forward with starting it Sunday before the next round starts! She also recommended having Emily start taking 3 tabs of nifurtimox on Sunday through Saturday the day after last day of chemo! Dad and our are really thinking about doing 3 tabs throughout the whole 21 days of the round! Dr Sholler also recommended Emily start Zometa which is a bone strengthener and also been known and tested to help with metastasis in the bones! So Emily will get this on the first day on the next two rounds and then monthly after that! So Monday starts Round 5 of nifurtimox trial (actually round 13 of actual chemo's that she has received) and its a possibility she may need platelets again come Monday! We did talk about platelets with Sholler and we will review them after this round and see what happens with them and what she may need to do! By the way, if you have kept up with this post all this way it means so much to us and sorry for all the talk through this post but really wanted to let everyone know where things where and how they went! Emily does have a donor number for va blood services so once we get home I am going to get with our good friend Mary Ann Waters (daughter Abbie who passed away in April of last year, Facebook Abbie's Peeps) and she will help us with getting a donor session in Emily's honor set up! We hope that you will help because we understand platelets have become spare here and there at our home hospital by reading someone else's update! Thanks for reading and hope for the next 2 rounds to be as easy as round 4 was with no problems and no fevers and no inpatients stays! And continue to hope for clear/clearer scans when we return back to Michigan! We are on our way to meet up with Wings of Mercy and have a 3 hour flight to Michigan! Send your thoughts and love! We have scanxiety...and there is no way around getting out of that feeling that comes along with scans to see if the clinical trial that Emily is on is working. Is it Friday yet? We are ready for Friday because this would mean that we have already flown into Michigan, had the MIBG Injection and had the MIBG/CT fused scan and already talked to Dr. Sholler to know where Emily's scans stand and we would be on our way home back to Virginia. 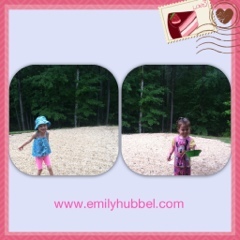 Emily had a great weekend, although the weather was extremely hot, the girls spent the weekend in the pool at home. We also got to see some fireworks again, which Emily really enjoyed and just being out of the house. Monday Emily had clinic and her counts were looking good, she didn't need any platelets or blood and her WBC/ANC is up, so based off that information she is ready to start Round 5 of Nirfurtimox Clinical Trial (cumulative chemo round 13 -- WOW) She also handled getting her port accessed again like a princess with hardly no crying and definitely no tears. We are so proud of her. Round 4 has been one of the weirdest rounds we have had yet. Emily overall did great, she has had energy (besides when her hemoglobin was low) and been playing and having fun. She never reached a point of completely stopping eating like she has the last 3 rounds, and she not once even reached having a temperature, or even fever watching. Thankful, it was nice and Emily right now is at 27.5 lbs, when last round we were at 25 lbs. Tomorrow we leave for Michigan, again through a wonderful organization, Wings of Mercy, who have been so helpful to us the past few times we have made the trip to Michigan. Early morning, so we can get there and get the car rental, which Northern Air was so grateful to offer a discounted price, and get to the hospital to Emily can have her MIBG Injection. After than we will need to check into the Renucci House and get settled in.Thursday will be another early day of waking the girls up nice and early and get them moving early morning so that when it is time for Emily's scans, they both fall asleep. This has worked the past two times, so we are hopeful this works again. Scanxiety is high. Our biggest worry (as any cancer parent) is progression. Emily has never been clear (NED - No evidence of disease) and this is one of our biggest hopes is to get the news of NED. HOPE! 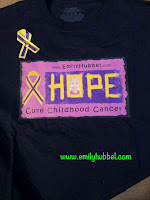 We ask that you leave Emily lots of love and HOPE for scans to be better than last time or better yet NED. We also ask that you continue to spread the awareness of Emily and all the other children fighting childhood cancer. We will update more as we have more. Another week of visiting the clinic twice a week. 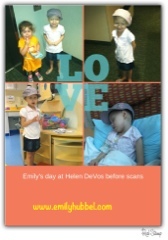 Both Monday and today have been long days in the clinic for Emily. 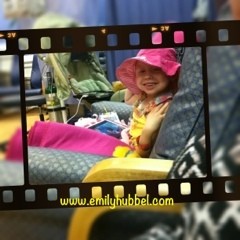 Monday Emily had clinic to check counts and she needed both platelets and blood. Platelets definitely because her gums were bleeding when she was brushing her teeth along with bruises , but I asked that they do a blood transfusion since her blood counts were dropping so much and didn't want to make a trip over the holiday. After giving her the platelets transfusion while waiting for the blood, we were talking with a couple of other families and I noticed a bump on Emily's forehead, but thought it was just a bug bite, since she said it itched and one of the nurses saw it and said Emily was having a reaction and she had a few other places on her head. She hasn't had a reaction in over a year, we were all shocked she was having a reaction an hour after the platelet transfusion had stopped, so they had to give her benadryl and wait for the bumps to go away. By this time it was too late to even start blood, so it would have to wait until Emily's next appointment on Thursday. Emily did have a nice 4th of July and we all together as a family, which is really what it was all about. Tuesday evening we went do to the James and saw the fireworks and enjoyed the works and then the 4th of July we cooked out as a family and enjoyed spending time together in the pool together. It was a great time to spend together with one another and have each other. Today another long day of needing blood and platelets. Blood dropped quite a bit from Monday to today and it was quite noticeable this morning. She was very sleepy and out of it. Later the benadryl to get platelets didn't help that. However after some blood, Emily's color looks much better. We worried about leaving platelets at 18 when Monday they were 14 (with platelets) and not getting any. So we did request that she get them, because bleeding scares me. I worry that she ever hit her head and starts bleeding and we can't stop it. T.he head is one of the biggest worries. Anything under 50 is just dangerous to play around with anyway. Next week is scanxiety week. Its been a long haul to figure out when scans were because they kept being changed from week to week and what days, but it appears that they have been scheduled for MIBG Injection on Wednesday with scan on Thursday. Scans for parents are always a huge worry, especially when on a clinical trial with a doctor away from home. We will leave on Wednesday morning and return Friday sometime. We watch Emily blossom and turn into a young lady so quickly. The things that she knows are beyond her age and we are just amazed at how well she takes them. 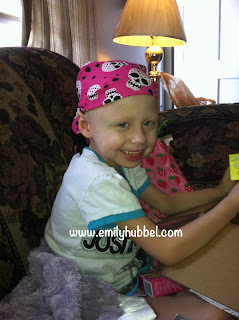 Just in February Emily had her broviac line taken out and now has a port which has to be accessed each time. Emily's anxiety builds each time she has clinic and she stresses and worries about the port being accessed. Daddy and I are so proud of her as the past 2 times this week that she was accessed, that she barely made a peep. She was accessed and did amazing. emily we are so proud of you, you continue to blossom and grow and while we would give anything that you didn't have to go through this, you still continue to amaze us in your journey. I watch Daddy look at Emily in awe of all that she has had to endure and the way that she handles it. She handles this journey with such ease and we are so proud of her. Emily gave her first Team Emily bag away on Monday to a little girl who was just diagnosed in May of Medulloblastoma, her name is Emily also. 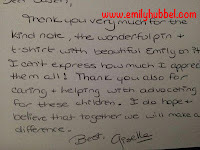 Emily is such a sweet girl and we love their family. 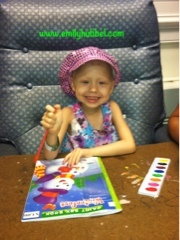 If you would like to read more about Emily, you can read about her here on caringbridge: EmilyGriffin. While I wished I had taken a picture, it was just as sweet to see Emily give away her first Team Emily bag. Hope. We are hoping for stable or better for scans next week and out of all seriousness we would really like to see better with continuing to see HMA and VMA low. Better would be what we would really like to see, because if no change, we are really going to have a talk with Sholler about whats next and if continuing on the trial is the right thing to do when there is no change. Of course the biggest worry is change meaning progressing, because... well I don't want to get to ahead of ourselves. Hope everyone had a great July 4th! !